The U.S. Senate prepared to vote late Tuesday on an overhaul of the federal tax code, a step toward President Donald Trump’s first major legislative victory on a bill that is expected to trigger far-reaching consequences for the U.S. and global economy. If approved by the Senate, the bill will have to go back to the House of Representatives for another vote. Earlier Tuesday, the House passed a version of the legislation that leaders expected would be their final action on the matter. 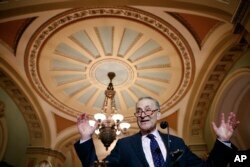 But Senate Democrats found procedural glitch that forced Republicans to change the bill and send to back to the House. Trump took to Twitter to hail "all great House Republicans who voted in favor of cutting your taxes!" The battle immediately shifted to the Senate, where Republicans said they have the votes for passage. "This is a great day for America because we're going to pass a pro-growth, pro-jobs, pro-America bill," said Senate Finance Committee Chairman Orrin Hatch, a Utah Republican. "Republicans will rue the day they passed this bill," said Senate Minority Leader Chuck Schumer, a New York Democrat. "Republicans have taken what they call a once-in-a-generation opportunity on tax reform and squandered it on corporate welfare and tax cuts for the rich." Senate Minority Leader Chuck Schumer of N.Y. speaks after a caucus luncheon on Capitol Hill in Washington, Dec. 19, 2017. The bill permanently slashes corporate taxes, temporarily cuts taxes paid by American wage and salary earners, caps popular tax deductions, and hikes the U.S. national debt by at least $1 trillion over a decade. "We have labored for too long behind the rest of the world," said Pennsylvania Representative Mike Kelly. "Corporations will stay [in the United States]. They will make investments in land and bricks and mortar, equipment, education and making our workers the best workers in the world and able to compete anywhere and win." Republican Senator John Thune of South Dakota said, "Countries around the globe are getting the message, loud and clear, that America is committed to leading in the 21st century. We're committed to leading when it comes to innovation and growth. We're committed to leading when it comes to ensuring that American companies can stay here and compete and keep jobs here against foreign competition." Democrats slammed the bill as mortgaging America's future in order to pad the pockets of the wealthy. "From the start, this bill was laser-focused on showering multinational corporations, special interests, and heirs-in-waiting with a never-ending stream of tax breaks," Oregon Senator Ron Wyden said. "The giveaways were made possible only by digging into the pockets of the middle class." "For years I've heard members of the majority [Republicans] come to the floor talking about the need to address the national debt," Democratic Representative Louise Slaughter of New York said. "This bill explodes the deficit by $1.5 trillion." 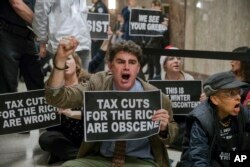 FILE - Protesters shout their disapproval of the Republican tax bill outside the Senate Budget Committee hearing room on Capitol Hill in Washington, Nov. 28, 2017. The nonpartisan Tax Policy Center concluded the bill would cut taxes for 95 percent of Americans next year, but average cuts for top earners would greatly exceed reductions for people earning less. The legislation also partially repeals former President Barack Obama's signature health care law, eliminating the requirement that Americans purchase health care insurance. As a result, some 13 million fewer Americans would be insured over the next decade, according to the Congressional Budget Office. Republicans said a multitude of benefits will flow from the tax bill, including the repatriation of vast sums held by U.S. corporations oversees and a surge of investment domestically that would create jobs and raise wages. "Is it good to bring back investment and offshore income here? Yes," Representative Greg Walden of Oregon said. "That creates really good paying jobs." Democrats disputed the rosy predictions. "What has been sold as a job creator and wage booster will, of course, do little of either, as companies are already initiating stock buybacks worth hundreds of millions of dollars, instead of hiring more workers and raising wages," Schumer said. Democrats also focused on the tax bill's generous provisions for wealthy landowners and investors, including Trump. "How many millions of dollars the Trump family will personally stuff in their pockets cannot be precisely determined," Texas Democratic Representative Lloyd Doggett said. Trump has said he expects to be worse off financially, not better off, as a result of the tax bill. Democrats countered that Trump's assertion is meaningless until he releases his tax returns. House Minority Leader Nancy Pelosi of Calif., speaks during a news conference in opposition to the Republican tax bill, Dec. 19, 2017, on Capitol Hill in Washington. 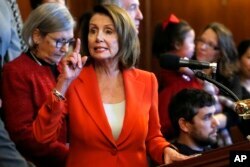 "The majority has the votes and there is not much Democrats can do to stop it," Slaughter said. Republicans were unapologetic in anticipation of victory. "We do come to Washington to cut taxes and let people keep more of their hard-earned money," Wyoming Senator John Barrasso said. "And we're doing that today." Public opinion polls consistently showed more Americans opposing than backing the bill. Several Republican lawmakers have blamed the news media, saying reporters misrepresented the tax bill and downplayed its potential benefits.